My recently-published book,”The Psychology of Everything: Driving” is one in a series of short books by Routledge that show how psychology can provide insights into every aspect of our daily lives. My book deals with a behaviour that can have deadly consequences: worldwide, every year, one and a quarter million people are killed on the roads, and 50 million seriously injured. Driving is the biggest cause of death amongst 15-29 year olds, especially young men. My main aims with the book were twofold. Firstly, I wanted to show that psychology, as the science of the mind and behaviour, has a vital role to play in reducing road accidents, given that the vast majority are primarily due to human error. Secondly, I wanted to show how research can debunk some of the many myths relating to driving that are based on intuition, “common-sense” or pseudo-science. One myth is the notion that drivers pull out in front of motorcyclists and cyclists at junctions because the small size of two-wheelers makes them hard to see. Size has nothing to do with these kinds of accidents. At the close distances at which collisions typically occur, the motorcyclist or cyclist casts a large image on the offending driver’s retina, way above any sensory thresholds. Lots of research shows convincingly that the real reason why drivers pull out in front of two-wheelers is because they are not expecting to see them: their search patterns are optimised for detecting larger vehicles because these are encountered much more frequently on our roads. As the psychologist Richard Gregory once said, “We not only believe what we see, we see what we believe”. Another myth is the idea that all elderly drivers are dangerous and that their problems are primarily due to their poor eyesight. The evidence simply does not support either of these assertions. Most elderly drivers are actually very safe: chronological age per se is no guide to driving competence and it would be unproductive (and highly unfair) to compulsorily re-test drivers purely on the basis of their age. With age comes an increasing risk of ill-health, and it is actually a minority of unhealthy drivers, who also happen to be elderly, who are at greater risk of an accident. They give their age-group an unjustly bad reputation. “Risk compensation” is another myth I wanted to challenge: I wish I had a pound for every time someone has told me that everyone would drive much more safely if there were a large spike attached to the steering wheel! The truth is they probably wouldn’t: research shows that drivers are actually remarkably poor at assessing risk. Their decisions are influenced by irrational factors well-known to researchers on reasoning, such as the “availability heuristic” (decision-making is unduly influenced by well-publicised information). Because road accidents are so commonplace, they receive scant media attention compared to plane crashes, and hence the riskiness of driving is underestimated by everyone except accident investigators and the emergency services. The biggest myth is that the technological systems being introduced into modern vehicles are safe. Many drivers mistakenly believe that “hand-held” phones are dangerous but “hands-free” phones are safe. Twenty years of research shows clearly that hands-free phones are just as dangerous as hand-held ones – because the primary problem is that phone conversations are a serious distraction from the act of driving. Driving laws in many countries (including the U.K.) perpetuate the misconception that drivers are safe as long as they have their hands on the wheel – as do vehicle manufacturers, perhaps because “infotainment” is an industry worth billions of dollars. As well as enabling drivers to distract themselves, car manufacturers are falling over each other to be the first to introduce various “safety aids”. Cars can now automatically maintain their lane position, drive at a safe distance from the vehicle in front, maintain a chosen speed and apply the brakes if they detect a hazard in front of them. The “semi-autonomous car” is supposed to make driving easier and more relaxing. However psychological research on attention clearly shows this is a very bad idea: the driver’s task switches from actively controlling the car to merely monitoring what the car is doing, and we are notoriously poor at vigilance tasks of this kind. Research demonstrates that when these systems fail – and they will do at some point – the driver is poorly equipped to take prompt action to recover the situation. Since the first cars emerged in the 1880s, driving has changed tremendously. In the early days, it mainly consisted of controlling the vehicle, not just by steering and braking but also in terms of adjusting the engine settings, as nothing was automatic. Now, very rapidly, driving is becoming a highly cognitive task, even to the point where vehicle control is almost entirely relinquished to automated systems. Consequently, the psychology of driving is more relevant than ever before. Dr Graham Hole’s book is part of the The Psychology of Everything series published by Routledge Psychology. 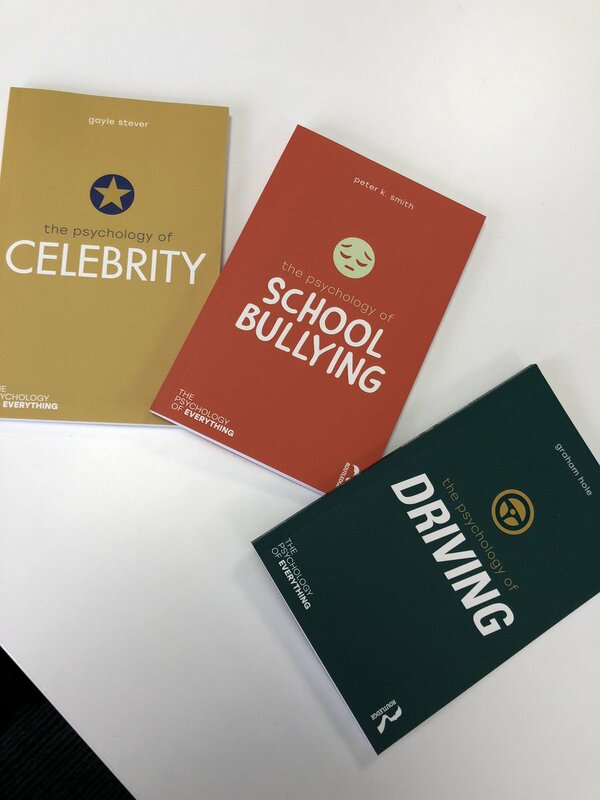 The magazine of the British Psychological Society, The Psychologist, recently featured a review of the series written by Jon Sutton.